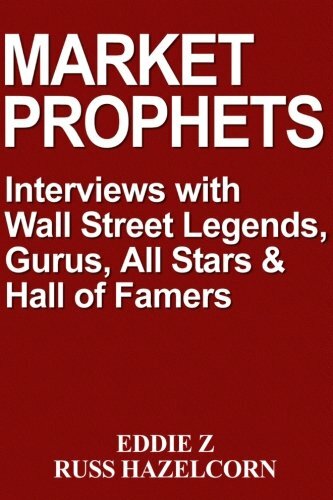 Market Prophets: Eddie Z’s Interviews with Wall Street Legends, Gurus, All Stars, and Hall of Famers is a priceless collection of stories, anecdotes, experiences, and trading insights from some of the most successful traders in the last 50 years. Some of these traders you may have heard of and others will be totally new to you. Either way, this collection of experience and know-how, represents a combined lifetime earnings over $100 million dollars and over 100 years of full time engagement with the markets. As a veteran or new trader, you may be asking yourself: “Why is it important to hear the stories of experienced, successful traders?” There are several good reasons: The first reason is to get an idea of the learning curve involved in becoming a successful trader. Like any other skill, trading requires hours of practice, learning, and hands-on experience—especially learning from mistakes. These interviews are the best way to find out the biggest mistakes that even successful traders have made on their way to becoming consistently profitable. Second, experienced, veteran traders have the ability to give you insights and distinctions that you otherwise may not get anywhere else. Guys who have been in the trading trenches have the ability to see market events and phenomena well before the average person does. This high level of experience and training can be compared to the 20 year Navy Seal. In other words, these guys have the absolute highest level of training and years and years of successful combat missions. Think of it this way, if you were learning to play basketball, wouldn’t you want Michael Jordan to be your personal coach? Wouldn’t it be great to sit down with Kareem or Magic and hear about what worked for them and what didn’t? The third reason to learn about successful traders is to give you historical perspective of Wall Street over the last 50 years so you can see exactly what has changed and what has stayed the same. This way you can get an idea of where the art and skill of trading has come from and where it’s headed in the future. The goal of this book is to give you insights and experiences from some of the world’s very best traders. Let these interviews serve as your personal virtual coach. I am certain that what you read will not only entertain you but also actually leapfrog you up your own learning curve. I sincerely hope you enjoy reading this book as much as I enjoyed interviewing these traders. If you have any questions about this product by Eddie Z Russ Hazelcorn, contact us by completing and submitting the form below. If you are looking for a specif part number, please include it with your message.